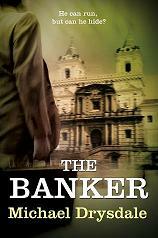 I think it’s time to hold my first competition and offer a copy of The Banker as a prize. The scene in chapter one where Sir Phil Black meets Strelnikov was influenced by an opening scene in a well known movie. To win the prize you need to name both the director and the film. I will give a bit of a clue: it’s a US director and the film was released in the last 5 years. The closing date is the 6th of March 2012. All correct answers will go into a hat and one lucky entrant will receive a copy of The Banker.